There were a lot of storylines going into Wednesday’s Rivalry Night game against Washington, and a lot that came out of it. But as goalie Marc-Andre Fleury said, who earned his second shutout of the season and 25th of his career in Pittsburgh’s 4-0 win, all that truly mattered was that the Pens earned a crucial two points. “It’s always a good rivalry with them, but the bottom line I think you’ve got to focus on is the win,” said Fleury. That being said, coach Dan Bylsma was proud of the way his guys played in such a big game against a tough opponent with first place in the Metropolitan Division on the line. With the win, the Pens built their lead to three points over the Caps. The Pens had an excellent start, outshooting the Caps 17-6 and taking a 2-0 lead into the first intermission. And while there was a stretch in the second where the game opened up, but the Pens recovered and returned to playing the right way – adding two more goals and absolutely suffocating Alex Ovechkin and the rest of the Caps in the third to preserve the lead. Paul Martin, Beau Bennett, Sidney Crosby and James Neal all scored for the Penguins. Covering the Pens on a daily basis, sometimes it can easy to forget just how much talent and skill they are able to put on their top power-play unit – two of the world’s best players in Crosby and Malkin, the guy they both would like for their linemate and one of the league’s most consistent producers the past couple seasons in Chris Kunitz, and a 40-goal scorer in James Neal. But on Wednesday, they reminded us just what they’re capable of. When the Caps were caught with too many men on the ice late in the second period, those four combined for a perfect passing play that resulted in a spectacular power-play goal in the span of about two seconds. It was a truly magnificent tic-tac-toe sequence. From the wall, Malkin went to Kunitz in front of the net, who pushed it back to Neal on the goal line. He slid a pass through the crease to Crosby, who had to go down to one knee to get the shot off from a crazy angle short side past Holtby, who was sliding into position and gave Crosby barely any room to shoot. But the captain just did what he does, firing it into the tiny sliver of open space for his 11th goal of the season. This morning, I asked Pascal Dupuis what the Pens could build on from their big 4-1 win over the Ducks on Monday tonight against the Capitals. “Well, we definitely can’t start the way we started last game without a shot in 18 minutes,” he quipped. The Pens were clearly motivated to redeem themselves for Monday's uneventful first period tonight against the Capitals. Instead of entering this first intermission with just three shots (which were all recorded in the final two minutes) like they did on Monday, tonight after 20 minutes the Pens had a 2-0 lead and a 17-6 advantage in shots. And not only that, but they killed off two full penalties and part of a third against what had been the NHL’s second-ranked power play coming into tonight. The Pens have now allowed just one opposition power-play goal in their last 10 games and have gone 24-for-25 (96 percent) over that stretch. Martin opened the scoring just 6:38 into the period, which deflated the riotous crowd at Verizon Center – which had watched their team win six straight in the building entering tonight. Then just over five minutes later, Bennett scored his first of the season to give the Pens a big two-goal lead they would not relinquish throughout the game – building on it later with Crosby's late second-period goal and Neal's tally in the third to put the Caps in a hole they could not climb out of. Fleury has been consistent for the Pens all season; he just wasn’t getting rewarded with wins for a stretch there. But he got a big one on Monday and followed that up with a shutout Wednesday. Fleury was right. Martin said this morning that defending against a club like the Caps – who have so many dangerous players, including the NHL's leading goal scorer in Alex Ovechkin – would take a total team effort, including the forwards coming back to help out and take away their time and space. And they did that all game, keeping the Caps to the perimeter and not allowing them a lot of quality chances, especially at even strength. The forwards circling so deep resulted in textbook breakouts and the puck support all over the ice from all five skaters, especially through the neutral zone, was fantastic, as was their speed on the transition. Overall, the Pens put on a defensive clinic tonight at Verizon Center – save for a few minutes in the second period where they got sloppy with the puck and passive in their own end after the Caps gained momentum off a terrific shorthanded showing, and the game opened up during that span as a result. 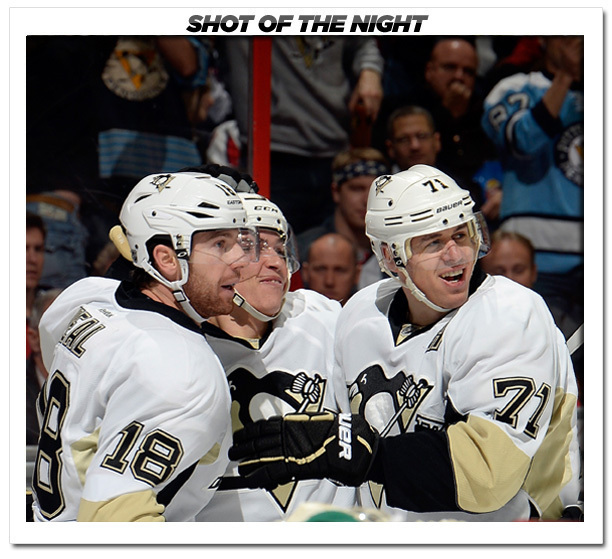 But the Pens regained their composure, calmed down and returned to playing “smothering” hockey, as Bylsma called it. They locked it down in the third period, allowing the Caps just four shots in that final 20 minutes and just 18 overall in the game. That's tremendous, especially considering how much Ovechkin and the Caps try and shoot the puck. "I thought the guys played hard there in the third preserving the shutout for him," Bylsma said.